According to documents, by archival materials the history of Elabuga is traced since the middle of XVI century, beginning from the epoch of Kazanskoe realm conquest by Ivan Grozniy. At the same time on the bank of river Toima, in the ruined fortress Alabuga, Troitskiy Friary was founded. His first prior, apparently, was a monk of Kostromskoy Epiphany monastery John Zeleniy. Troitskiy Friary existed till XVIII century. Near the monastery a suburb was formed and later it got the name “Podmonastyrka”. There were the village Trehsvjatskoie near the settlement, which’s name the local tale relates to icon of three saints – Vasiliy Velikiy, Grigoriy Bogoslov and John Zlatoust, according to legend, it was gifted by John Grozniy. “Judging from extant documents of XVII century, village Trehsvjatskoie was located on a hole called Elabuga”, – I.V. Shishkin notes in his historic work. A famous traveller academician N.P. 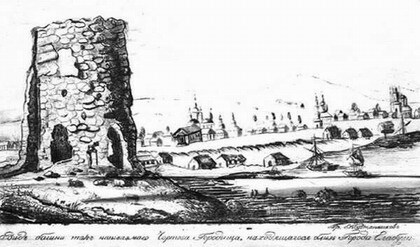 Rychkov wrote: “In XVII century village Trehsvjatskoie was palatial, patrimony of royal family; the village was fortified with a ditch and wooden wall, and at the centre of the residence there were another fortification served as castle where cathedral church, chancellery and steward’s house were placed. Structure of this fortress was like next: the fortress was fortified with towers, each tower had at its foot a gate with locks, above there were premises for guards and officials. On the outside the top was decorated with emblem of Tsarist Russia – double-headed eagle. Towers were named after roads – Kazanskaia, Sarapulskaia, after that Nikolskaia, Lugovaia, Spasskaia. In towers’ walls there were gun slots for gun barrels. In the fortress – cannons, spears, guns, and its location helped to parry any attack or siege. In short, the fortress was considered almost inaccessible. Village Trehsvjatskoie was known due to fishing and skilled artificers. Here people produced tissues of home making, curried, made leather shoes, wooden, clay, elm and iron houseware. Ataman Ermak Timofeevich with his force on the way to Siberia stopped at Trehsvjatskoie to replenish his stores. Emelian Pugachev with twenry-thousand army stood at Toiminskie meadows making his way to Kazan from Izhevsk. According to local tale, a procession with revered icon “The Holy Face” came across the impostor. Glancing on the icon, the impostor came back to his camp in complete disarray. The next morning murderer became blind. Indefatigable repentance before God allowed restoring eyesight. But Pugachev retreated from the village without making any harm to its inhabitants.